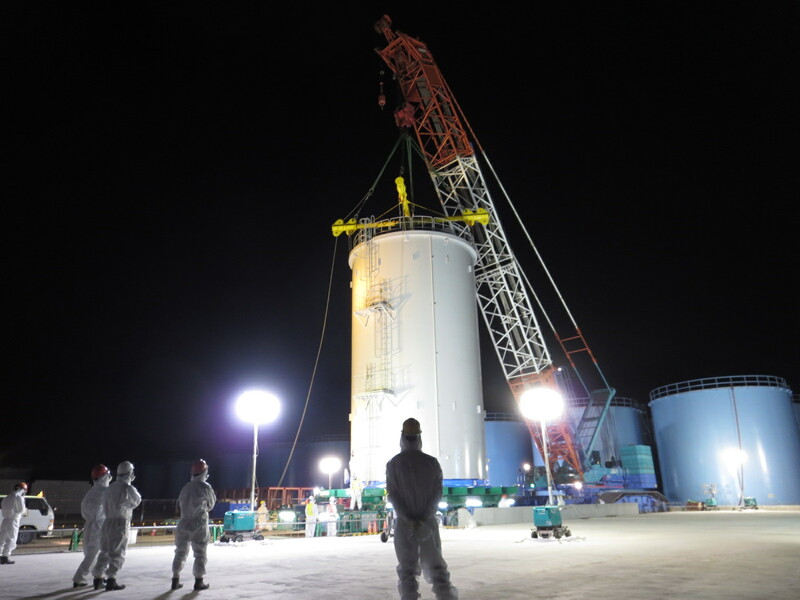 Workers at the Fukushima Daiichi nuclear power plant stand by as new storage tanks are hoisted into position. TEPCO, the utility which operated the Fukushima Daiichi plant promised to treat all contaminated water by March 2015, a goal it is now admitting will not be realized. While dealing with the contaminated water is one of essential parts of the clean-up process, many of TEPCO’s repeated efforts to bring the problem under control have been focused more on speed than effectiveness or quality. Tanks were built hastily to hold highly contaminated water, which lead to a variety of leaks and related issues. The Advanced Liquid Processing System, ALPS, has yet to function reliably. On Wednesday, a ton of contaminated water overflowed from one of the tanks which make up the ALPS system. Prime Minister Abe has pledged 50 billion yen ($487,300,000 USD) to help handle the issues with the contaminated worker, including pumping groundwater up before it reaches the site and installing an ice-wall to redirect water as it passes through the site on its way to the Pacific Ocean, but no meaningful progress has been made in these areas. Officials from the Nuclear Regulation Authority of Japan have raised questions about the safety of TEPCO’s plans to deal with the contaminated water. Some experts have questioned what the effects would be on the ice wall if the station were to experience a power blackout and have encouraged the utility to further study all of the risks related to the project.